Afghans have a different understanding of "democracy" than most Westerners. And it really matters. International color idioms in various languages. A diary from Thursday's quickly-quelled Cameroon protests. Oh, Invisible Children, why would you do this? A short documentary on the Women of Kireka project in Uganda. A beautiful reflection on Egypt's freedom day. 100,000 shirts drags on. Oh, World Vision. If you'd just admit it was a mistake and move on, we'd all be better off. I think Gadhafi's a goner regardless of how many more 90-minute rants he subjects us to. Here's an analysis by Geoffrey York of what the impact will be for Africa and the African Union (featuring a couple of quotes from me), a great infographic on Gadhafi's reach in Africa (excuse the inclusion of Tunisia in Libya), and a nice analysis of other flashpoints on the continent that could be ignited or exacerbated by Gadhafi's fall. As far as I can tell, the African Union has yet to make any kind of statement on Gadhafi or Libya. Which makes sense considering how much of their budget he funds. By the way, the AP Stylebook apparently spells it "Gadhafi," so that's what I'm trying to use. Somali pirates killed four American hostages today, which prompted US military forces to kill two pirates and arrest thirteen others. This represents a significant shift; pirates have usually operated with the view that live hostages are worth more than dead ones. These killings appear to have happened in response to imminent US military action to rescue the hostages. It will be interesting to see how this shakes out. In Cote d'Ivoire, Laurent Gbagbo appears to be taking advantage of the world's attention being focused elsewhere to perpetrate human rights abuses and killings against Ouattara supporters. At least six people were killed Monday in a violent crackdown against protesters. In the DRC, Lt. Colonel Kibibi Mutware has been sentenced to 20 years in prison for his role in directing the New Year's Day rapes in Fizi. This is significant not only because Mutware is facing justice for his crimes through the use of a unique mobile court, but also because 49 women came forward to testify against him. This extraordinarily brave and difficult act by these survivors made all the difference in securing Mutware's conviction. These women are to be commended at the highest levels, and I hope other victims will see from their example that speaking out helps to achieve justice. It is possible to end impunity in the DRC. Kudos to the American Bar Association, the Open Society Initiative for Southern Africa, and the Open Society Justice Initiative for funding the court's operations. Mass protests were scheduled for today in Gabon, but I haven't found any information on them. If you have updates or info, please post links in the comments. 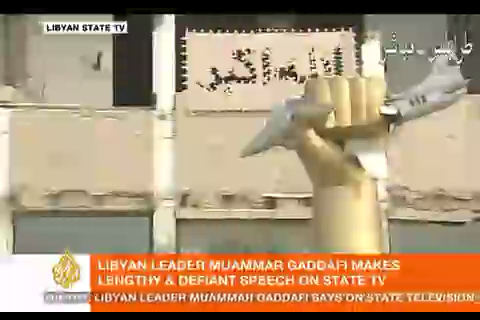 Photo: Screengrab from Al Jazeera English of what is apparently Gadhafi's courtyard sculpture. It certainly makes a statement, n'est pas? As the World Vision/NFL 100,000 t-shirts controversy swells on (now with a post on Freakonomics!) , I thought it might be useful to talk about the research that shows why t-shirts is a matter of bad aid. If your eyes glaze over at the thought of JSTOR and academic journals, I can sum it up for you in one sentence: the evidence is solid that t-shirt donations are bad for local economies. For those of you wanting to go a little more in depth, read on. One of the best known and most-referenced articles on the subject is "Used-clothing Donations and Apparel Production in Africa" by Garth Frazer. There's a gated version of the article here. Frazer set out to explain why African economies haven't advanced beyond basic manufacturing. He concludes that one major factor prohibiting the development of major textile industries is used-clothing donations by consumers in industrialized countries. That is, if you box up your old t-shirts and take them to Goodwill, you may actually be inadvertently undermining the development of clothing production facilities in Africa. Why? Because with a huge supply of cheap apparel that is ready for sale, there's no need to build factories to produce more. These are not insignificant effects; Frazer finds that "Used-clothing imports are found to have a negative impact on apparel production inAfrica, explaining roughly 40% of the decline in production and 50% of the decline in employment over the period 1981–2000." In other words, clothing imports result in job loss for people who could probably otherwise lift themselves out of poverty. Frazer is dealing with used clothing, of course, but there's little reason to think that new clothing would be any different, especially since World Vision will be distributing it for free. In fact, free clothing donations undermine the secondhand clothing markets that provide what employment does exist in the sector. Daniel Slesnik tackles the problem of in-kind goods more generally in "Consumption and Poverty: How Effective are In-Kind Transfers?" (also gated). Slesnik does not study the developing world here, but rather looks at programs designed to tackle poverty in industrialized states. He finds that, in order to be effective at poverty alleviation, in-kind transfers have to be highly targeted and the valuation recipients place on the transfers. In other words, the recipients have to be getting appropriate aid that actually solves their problems, and they have to place as much or more value on the in-kind transfer as they would on cold hard cash. How is this relevant for World Vision? Well, it suggests that any kind of in-kind donation that is not highly targeted and valued by recipients is a waste of effort, money, and resources. As Bill Westerly points out, this gets pretty messy when we take into account the cost of actually getting the shirts to the recipients. If $A isn't less than $B, then it's a big mistake. These are just a couple of examples of the body of research that clearly shows the negative impact of clothing donations on developing economies. There's just no way World Vision can honestly claim that these facts are unknown or that the impact of a clothing donation is unclear. Not only this but World Vision is a Christian organization whose goal is ”to follow our Lord and Saviour Jesus Christ in working with the poor and oppressed to promote human transformation, seek justice and bear witness to the good news of the Kingdom of God.” Is supporting wasteful production, obscuring the value of these goods, and marketing harmful practices truly working to promote transformation? Would Christ be open to such tokenism at the expense of responsible, sustainable aid? When Christ talks about, if you have two shirts give one to the poor, does he mean literally? We know this is bad aid. We know that GIK gifts of items (like clothing) that are readily available in a country undermine local clothing markets, create dependence, and deprive poor people of work and the dignity work provides. We know this is unnecessary aid. There aren't any places in the world where t-shirts are not available at a market price determined by the local economy and affordable to local consumers. Both the NFL and World Vision get to claim benefits (the NFL for taxes, World Vision for its bottom line), look good in the public relations arena, and don't owe anyone an explanation of whether the t-shirts actually do anyone any good. There is an opportunity cost associated with shipping 100,000 t-shirts to communities that don't need them and that have other serious development needs. What makes this so frustrating, of course, is that World Vision knows all these things. Every one of them. I've heard from friends who work there this week. Some are defensive about the issue, others are pounding their heads against their cubicle/Land Rover walls. World Vision isn't 1 Million Shirts' Jason, who was trying international development work for the first time and showed a willingness to learn from his mistakes. They know better. We don't conduct these activities in isolation. We only take targeted donations. Our field offices want shirts. We need the engagement of the American public. Goods in Kind are not ipso facto bad aid. I agree that all of the above propositions are true. There are lots of GIK that are quite good and necessary for sustainable development activities. Anti-retroviral drugs, technical items for constructing wells - any item that is not readily available in a developing country is a great donation that World Vision can and should use. The problem lies not with the general idea of using GIK, but rather with this GIK. As we've discussed ad infinitum, ad nauseum, t-shirts are not in short supply anywhere. This is not even about undermining local manufacturers; WV has been very careful to note that they're handing out shirts in places that have textile manufacturers, but that's not the point. Someone in each of these areas sells clothing, and that someone will lose business as a result of WV's donation of these t-shirts. As an organization that claims to be in the business of sustainable development, WV is directly and clearly undermining its own goals, not to mention those of the donors who give in the expectation that their goods will contribute to poverty alleviation. There's no way around it. As for the notion that local staff in WV request the goods, I find this to be an unconvincing argument. People want things that are not good for their communities all the time. Since the evidence on the negative impacts of t-shirt donations is so solid, why would World Vision not use this as an opportunity to educate local field staff about the issue? It says something sad about our society's materialism and greed that we can't wait a few days for the NFL to print up accurate t-shirts while not wasting money on printing ones it knows will not be sold. But it says something even sadder when an organization that purports to be engaged in poverty alleviation with a faith-based motive won't tell the NFL "no" when it is asked to do something that actually contributes to the causes of poverty and injustice. It matters if theology motivates your behavior, and that should be reflected in decisions the organization makes about GIK. World Vision, I think you can do better. This is a little bit outside of what we normally do here at TIA, but when I heard that events are scheduled for Commedia dell' Arte Day on every continent except Africa, I really wanted to help. (Seriously. The scientists at the South Pole are even staging an event.) Commedia dell'Arte is one of the oldest forms of theater in the world; it inspired much of Shakespeare's writing (especially the comedies). There are a lot of people who read this blog, and some of you have significant interests in the arts, connections to theater groups on the African continent, and the skills to make things happen. And it just so happens that the Faction of Fools Theatre Company, which sponsors the event, is run by one of the world's foremost Commedia dell'Arte experts who also happens to have been my high school classmate. So what do you say, loyal blog readers? Can we make sure that Africa isn't left out of this unique global cultural event? Here's all the information from Faction of Fools. All of this info is also available in French if you need it; contact the FoF team for more info at the address below. Where will you be on February 25, 2011? Do you want to organize a Commedia dell' Arte event IN YOUR OWN CITY as part of COMMEDIA DELL’ ARTE DAY? On February 25, 2011, simultaneous celebrations and events will occur all around the world as theatre companies, performers, scholars, students, and audience members celebrate Commedia dell' Arte with shows, conferences, lectures, and workshops. This worldwide festival was proclaimed by SAT and organized by Faction of Fools Theatre Company in Washington, DC, using viral and grassroots tools, such as Facebook, YouTube, and Twitter. We want events in every country, including yours! To find out more, join the Facebook group "Commedia dell' Arte Day" and visit the FAQ page. Faction of Fools is helping theatre companies—large and small—to produce shows in the style of Commedia dell’ Arte using traditional Commedia character types and scenarios, which will be available for free distribution on the Faction of Fools website. In Turin, Santibriganti Teatro will host the flagship event. Similarly, companies around the world will be coordinating with Faction of Fools to present performances on all seven continents (including Antarctica!). The full list of participants will be publicized at the official website. Did you know that Commedia dell’ Arte is not recognized as a UNESCO World Cultural Heritage? The United Nations’ cultural wing (UNESCO) has officially recognized various theatre traditions throughout the world, such as Japan’s Noh and Kabuki; however, the famous “stock characters” of Commedia dell’ Arte—Arlecchino (Harelquin), Pulcinella, Dottore (the Doctor), Pantalone (the Pantaloon), Scapin (Scapín), and Scaramuccia (Scarmouche)—have yet to be acknowledged. The Italian cultural Associazione SAT is petitioning the nation of Italy and the United Nations (UNESCO) for official recognition of this famous and monumental theatre form, and Faction of Fools Theatre Company in Washington, DC, is helping to support their cause with this COMMEDIA DELL’ ARTE DAY. You can view the stirring and amusing appeal by famous Italian Maestros online. To organize a Commedia dell’ Arte Day event in a theatre or classroom near you or to sign the petition for recognition of Commedia dell’ Arte as “World Cultural Heritage,” go to http://www.commediadellarteday.org/. You can also contact Faction of Fools through their website or Facebook group or email Artistic Director Matthew R. Wilson. I've been a bit incommunicado of late. Sorry about that, there are lots of looming deadlines in my future and preparing to be out of town on a tour du monde for an entire month is consuming most of my blogging time. Speaking of, if you're up for hanging out in Shanghai, Chengdu, Nanjing, Montreal, Miami, DC, or Chicago in March, let me know. I'll be giving public talks in Nanjing and Montreal and presenting at conferences in Montreal, Miami, and Chicago and would love to connect. Anyway, my inbox is alarmingly empty of hate mail, so let's talk Great Lakes politics for a bit. In late January, we passed the two-year anniversary of renegade Congolese general Laurent Nkunda's arrest by the Rwandan government. Nkunda has been held under house arrest just outside Kigali since that time without charge or trial. As Rwandan Minister of Justice Tharcisse Karugarama told Kenya's Daily Nation, Nkunda's case isn't easy. Trying a case you don't want to try never is. The main impediments to trying Nkunda have to do with issues over extradition to the DRC, including the fear that the DRC's amnesty law will allow Nkunda to walk free and the fact that Rwandan law prohibits extradition to states that use the death penalty, which the DRC does. Of course, the real place Nkunda should be tried is the ICC, and don't think for a minute that it wouldn't be possible for Rwanda to arrange a transfer of Nkunda directly into MONUSCO's hands, where he could be transferred to ICC custody with little fuss, thus avoiding the Congolese courts entirely. But that would mean a full trial of Nkunda in the public eye, which no one in Rwanda wants, because, as we've discussed before, Nkunda knows everybody's secrets and would have little to lose by exposing them. Meanwhile, back in Goma, Nkunda's one-time-number-two/current leader of the CNDP/possible leader in the FARDC depending on whom you ask Bosco Ntaganda has been involved in some shenanigans of his own of late, most recently involving a Nigerian plane that arrived in Goma carrying several million dollars in cold hard cash, apparently to buy gold. From Ntaganda. You can't make this stuff up, although, as Jason notes, one has to wonder about the type of shady characters who think Goma is the place to buy gold. Everybody knows the gold goes through Butembo, Bunia, and Bukavu. Duh. Ntaganda, by the way, is still avoiding an arrest warrant from the ICC, despite living quite openly in Goma and going about his everyday business of maintaining a parallel administrative structure for CNDP governance in Rutshuru territory and, apparently, trying to get away with multimillion dollar smuggling deals. I hear he can regularly be seen out and about enjoying Goma's finest dining establishments. So why won't anyone arrest Ntaganda? Meanwhile, the Rwandan government has had no problem prosecuting cases against its political enemies. Four exiled Rwandan leaders, all former members of the RPF regime and trusted Kagame deputies including former army external intelligence head Patrick Karegeya and Lt Gen Faustin Kayumba Nyamwasa, were sentenced to 20 and 24 year prison terms in absentia by a Rwandan military court. Finally, longtime friend/fawning admirer of Kagame Stephen Kinzer did an overnight about-face on his view of Kagame, calling him an authoritarian in a piece for the Guardian. As Jason notes, it's hard to overstate what an extreme change this is; I expect we won't be seeing any more fawning pieces about Kinzer like this one in the New Times anytime soon. Indeed, it appears the New Times has already turned on him. On a brighter note, the Voice of America reports that the government of Rwanda has agreed to review some of its laws restricting press freedom, free speech rights, and political freedom after being criticized at the meeting of the UN Human Rights Council. This would be a welcome change if it actually happens; as it currently stands, the broadly-written genocide ideology law makes it possible for any critical speech directed against the government to be construed as promoting genocide. My hopes that such a review will have any significant effect are limited, however, especially seeing as a Rwandan court just sentenced two journalists who wrote pieces critical of Kagame prior to August's elections to 7 and 17 years in prison. Louisa Lombard's excellent report on the CAR's recent elections. Social scientists, Marc Bellemare has some fantastic handouts for students on linear regression and causality. On corruption, development, and Nigeria. Two Lessons from Tunisia from the great Nick Van de Walle.